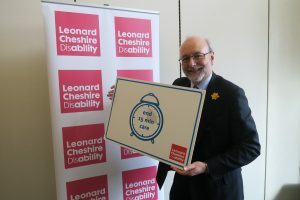 Member of Parliament for Stockton North, Alex Cunningham, today joined leading disability charity Leonard Cheshire in Parliament to back their calls for an end to flying 15 minute homecare visits. Research by the organisation has revealed that at least 33,305 people in England received 15-minute care visits in 2015/16. Of these, 16,311 received them in areas where councils admit to still using ‘flying’ visits for personal care to support people with intimate needs such as washing, dressing and eating. Short care visits continue despite statutory guidance accompanying the Care Act 2014, which came into force in April 2015, stating that short home-care visits of 15 minutes or less are not appropriate for people who need support with intimate care needs. The National Institute for Clinical Excellence (NICE) also advises that carers must spend a minimum of 30 minutes during visits to help keep people well. “These ‘flying’ care visits are completely unacceptable, forcing disabled people to choose between eating or going to the loo, depriving them of their dignity. Over 10,000 people have written to the Care Minister, David Mowat, in support of the campaign, urging him to take action to ensure social care is properly funded and put an end to these rushed care visits.